Deena is running from a dangerous past. When she finds herself in a small fishing village tucked away on the banks of the Chesapeake Bay, she thinks she is finally safe. While there, she discovers a journal that weaves a story of secrets, passion, and unrequited love. In its pages, she discovers the answers to her struggle with the shadows of her own past. In the end, those shadows close in on her and threaten all that she holds dear. Will Deena be able to protect herself and those around her from these darkening shadows? To cast a little light into her situation, Elmer Seward, author of ‘Set You Free: Love, Lies, and the Secrets that Bind’ has kindly agreed to help us navigate the depths of this tale of suspense. Elmer, let’s not keep our readers in suspense any longer, let’s get straight down to discussing where this tale came from. How did this idea originally begin? I think the idea for this book first came to me during a news report dealing with human trafficking. I’m always fascinated with the “after.” The disaster is only the impetus. What happens to individuals after the disaster tells the real story. You know, I’ve also wondered what happens those individuals ‘after’. And when you start thinking about how these people would act and interact, you have a huge number of interesting questions to answer. With so many questions to answer, did you find yourself returning to, or being inspired by experiences in your life to find the answers required? I think writers always draw on life experiences when they write. I live in a small town on the Chesapeake Bay and I drew on that to craft the tiny town of Opechancano. There are bits and pieces of friends and relatives in the characters that I write. The story is like a memory stew with a little of this and a little of that thrown in. Memory stew! Now that has to be the most creative description of a story that I’ve heard yet. For myself and readers, who are just starting to dig our spoons into this memory stew, what would you say is the most important taste, or idea, that we should be looking for as we work through our story filled bowls? I think that the most important thing that I want to say in all of my books is, “there’s hope”. If you can just find a way to let go of the past, you will find a future. Letting go of the past to find a better future and know that there’s hope is a fantastic message for the world at large today. We can’t spoil the future for those who haven’t read your novel yet, but instead, can you share a little of what you’ve lined up for your current and future writing projects? I’m currently working on my fourth novel. It isn’t a sequel to Set You Free, but the setting is near the fictional town of Opechancano on Virginia’s Eastern Shore (similar to Set You Free). It’s the story of a young woman who is struggling to break off a relationship and the troubling fallout this effort brings. Even for those readers who haven’t done a deep dive into your work, it’s clear to see that your books and the characters within them deal with incredibly emotional topics. With such strong emotions in play, what do you try to focus on as you write, to ensure that the story isn’t overwhelmed with too much emotion? When I’m writing, I have my characters in mind. They become real people to me and I want the reader to see their fears and joy. I want readers to cry with them and rejoice with them. With such a strong connection to your characters, do you feel energised by working through the emotional situations, or does the gravity of their lives exhaust you? Writing energizes me. I get lost in my story as I’m writing and become very close to my characters. I try to write characters that I would like to hang out with. I love that you’ve written characters that you want to hang out with! When you spend so much time with them, they have to be enjoyable! As you’ve continued to write well into your fourth book, do you ever take the time to look back and see how you’ve improved? Do you feel that your voice has improved? I’m not sure that my author voice has progressed as much as my ability to self-edit. I think I’ve become better at writing a compact story. We’ve all read something that needed more pruning before it was unleashed on the world, so I’m very happy to hear that this is a skill you’ve refined. Do you feel that this ability to self-edit and produce a compact story, has, in turn, developed a distinct author voice across your novels? And if so, have you started to consider how you would market your voice to readers? I think there are some signature features of an Elmer Seward novel. First, all of the action occurs over the span of one week (with the exception of flashbacks). Secondly, there are usually two characters who have hit emotional rock bottom and can find no way up. Their lives intersect and their interaction becomes the catalyst for redemption. Third, there is usually an element of danger. Three key features equal a fantastic gripping tale! Elmer, I just can’t wait any longer, I’m going to go into the danger with Deena again, so I’ll leave you here today, but I’d like to thank you again for joining me, and I hope that we’re enticed a few other readers to face the danger and emotions in Deena’s life in ‘Set You Free: Love, Lies, and the Secrets that Bind’. Excited to read the book we discussed today? Find it here on Amazon: ‘Set You Free: Love, Lies, and the Secrets that Bind ( ASIN: B07235HGLS )‘. 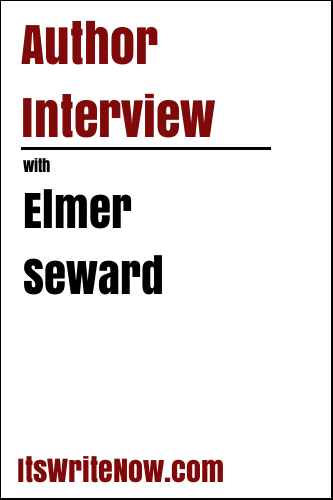 Want to find out more about Elmer Seward? Connect here!